This is a continuation of last week’s post on using white noise in FM8 for dance music. 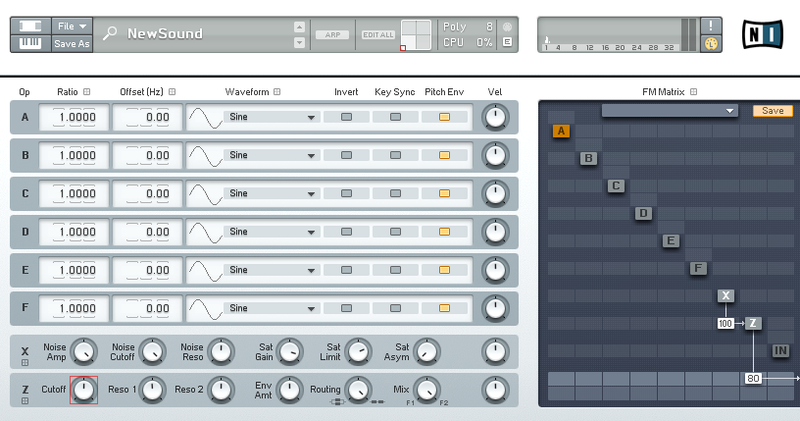 White noise plays a crucial role in the production of electronic music. Today we will be incorporating FM8’s filter (Z) to alter the sound of the white noise (X). I am going to show you 2 uses for it: ramping up to transitions, and “crash-like” sound that is cool for transitioning to quieter sections. Open up a new sound in FM8 and head to the ‘Ops’ section. Turn off Operator F and turn on X and Z (noise and filter). Route the white noise through the filter at a level of 100 and route the filter to the output at a level of 80 to leave some headroom. Turn the noise amplitude to 100. Then map a MIDI controller knob (or modulation wheel) to the cutoff of Z. Click MIDI learn, then click the cutoff of Z, and move your MIDI controller knob. Play a note and move your MIDI knob – you can hear how different this sounds from altering the noise cutoff of X, which we did in the last tutorial. Now let’s tweak the sound for the 2 different uses. For this use, it is very effective to use a bandpass filter. This can easily be achieved using FM8’s filter. In the ‘Z’ section under ‘Expert,’ turn pole 1 and 2 to opposite modes to create this. Keep the filter on the ‘serial’ setting and the resonances at 50. Head to the ‘Env’ section and for ‘X’ turn the attack down slightly and the release to as short as possible. The longer attack gets rid of any unwanted transients and the short release time sounds better for transitions, making the end of the note very abrupt. To ramp up to transitions play a note and move your MIDI controller knob from 0 up to a point you desire, right before the transition section. For this sound, we must first change the envelope to make a short attack and longer release. We also must change the filter setting to incorporate some more low-end and less resonance. Turn the resonance of 1 down to 30 and set ‘Par/Ser’ (Parallel/Serial) to 50. For a “crash-like” sound, start with the cutoff at 100 and when you play a note, very quickly move the cutoff knob down to zero. Effects are great for making this crash-like sound more interesting. I used a shelving EQ to boost highs and cut lows, along with reverb and delay.